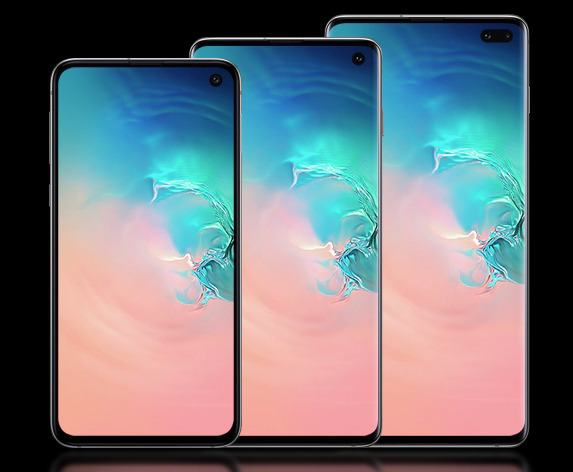 The Galaxy S10 range consists of the standard Galaxy S10 model, the larger Galaxy S10+, a new compact option called the Galaxy S10e, and a giant Galaxy S10 5G. The standard S10 features a 6.1-inch Quad HD+ AMOLED display with an integrated fingerprint sensor. Its most attention-grabbing element though is a "punch hole" for the front-facing camera, allowing true edge-to-edge screen area without the notch found on devices like the iPhone XS. Samsung also uses an ultrasonic fingerprint scanner to keep the display neat while still providing biometric security. The system reads the 3D contours of the physical thumbprint rather than a 2D image, which it says helps protect against spoofing. On the back is a triple camera setup with dual optical image stabilization, consisting of a 12MP telephoto lens, 12MP wide-angle lens, and a 16-megapixel ultra-wide lens, while on the front is a single 10MP sensor piking through the screen. Both the front and rear cameras will be able to shoot UHD-resolution video, with the rear versions also capable of recording in HDR10+, a first for mobile devices. The Galaxy S10+ sports a bigger 6.4-inch AMPLED screen that is the same resolution as the S10. Around the front, there's a dual camera setup using a 10MP selfie camera as well as an 8MP "RGB Depth" camera. The Galaxy S10e opts for a smaller 5.8-inch Full HD AMOLED display, lower than the other models. As well as having the single 10MP selfie camera at the font, it also has a downsized dual camera with OIS setup, using the 12MP wide-angle and 16MP ultra-wide cameras. The fourth device in the collection, the Galaxy S10 5G, boasts the largest AMOLED screen measuring 6.7 inches, while still having the same resolution as the S10 and S10+. Around the back the model goes one better again, adding a 3D depth mapping camera alongside the other three, while the front 10MP selfie camera is joined by a hQVGA-resolution 3D Depth camera. 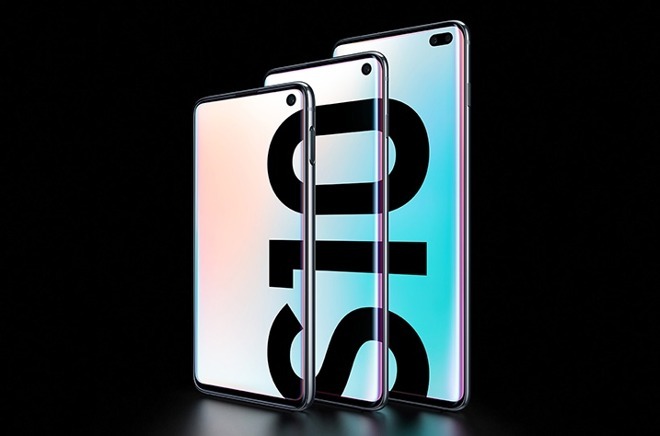 As the name suggests, the Galaxy S10 5G is also the first flagship from the company to offer 5G connectivity. While the others are limited to LTE speeds, the S10 5G will be capable of a maximum 2Gbps download and 150Mbps upload rates on supported networks. The phones sport a 7-nanometer or 8-nanometer 64-bit Octa-core processor with maximum clock speeds of 2.8GHz and 2.7GHz respectively, depending on the market and carrier. While the S10e will be offered with 6GB and 8GB memory options, all three of the others have 8 GB of memory, with an extra 12GB option for the Galaxy S10+. Capacity options range from 128GB to 1TB, with the maximum capacity only offered on the S10+, with microSD card expansion offered on all but the S10 5G. One notable new feature is Wireless Powershare, a feature that allows the wireless charging system in the Galaxy S10 to provide power to other Qi-certified wireless charging devices, even iPhones and smartwatches. The system is also able to allow two devices to be recharged from a single outlet, with the S10 able to take the power feed and then share it wirelessly with a second device at the same time. Samsung will start to ship the Galaxy S10, S10+, and S10e from March 8 in select markets, starting from $899.99, $999.99, and $749.99 respectively, with preorders commencing on February 21. Pricing and availability for the Galaxy S10 5G has yet to be determined. 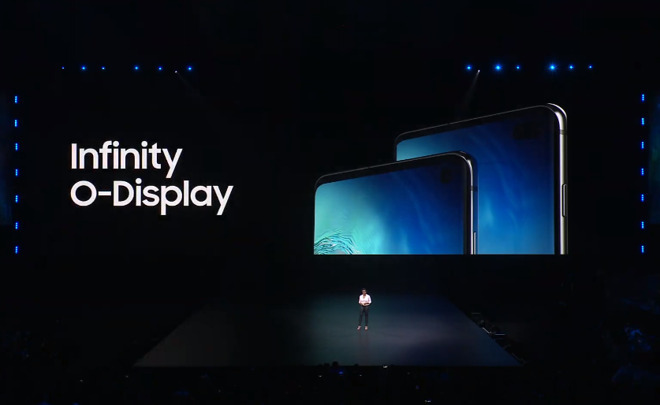 Samsung launched the Galaxy S10 lineup alongside a number of other items at its Unpacked event, including its Galaxy Fold folding smartphone. The hole punch is worse than the notch. the entire top right of the display is unusable in practical terms. It’s also ugly. I actually thought Apples lineup was a bit confusing! Nope. This one takes the cake. Really doesn't make any difference what Samsung does, or how seemingly cool it might be, still runs crappy insecure Android, just never going to do that..
What the hell is this? Tombstone with Kurt Russel and Val Kilmer? I am not even sure what to say... I really dont care what Samsung reveals but the ‘punch hole’ camera is bad. The dual lense ‘punch hole’ is even worse. We are in full arms race mode again bw Samsung/Hauwei/Google and others. I dont understand how the Note fits in this line-up anymore? I kove that $1980 price for the Fold! Except in reality they mainly fight each other. “We” don’t have to “be honest” if honesty is having your opinion. Objective honesty doesn’t apply to opinion. Awww bless them..... they've tried their best! For me Samsung is like having a kid that is not the sharpest knife in the bock, they come home with something completely unintelligible, you see the pride in their eyes, and you just have to smile and give them a pat on the shoulder and try and feign approval. On a serious note though, they've put some effort in with their cameras, remains to be seen if they hold up. Funny that Samsung is charging iPhone prices (if not WAY more now) for what is essentially a me-too lipstick-on-a-pig Android phone, and the Samdroids just lick that stuff up. Thanks, but no thanks. At least I know that my hard-earned money is better spent on a quality Apple phone than any of the junk that Samsung puts out. Looking forward to seeing these phones be the flops that they are. I see no reason for the 5g model to be separate from the 4g models, is there a reason for that other than charging higher prices for 5g access? Hardware is as good as the operating system. When the same company develops the OS and designs the hardware for it you have a winning combination. It is all in the ecosystem. O’h Apple stock up again over $1 in consecutive days. A refrigerator company released a new phone that runs an OS they have no control over, cute! Bigger phone, extra camera, 5g.